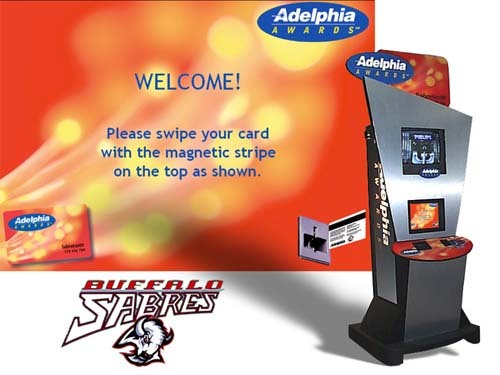 Adelphia Cable and the Buffalo Sabres have launched an innovative cross-market customer loyalty program. Adelphia customers that hold Sabres season tickets receive points and special offers for events they attend at Midland Marine Arena. Club members use a membership card to record attendance at a network of 8 interactive stadium kiosks. The kiosk network instantly checks a database for member profile. Members receive high-quality coupons that are individually targeted based on the member's database profile. Coupons provide special offers on merchandise in the arena and to communications services from Adelphia Cable. Attendance data is collected by the stadium network, and then synchronized with the master database maintained by Carlson Marketing in Minneapolis. The Wide Area Network connects Adelphia, Sabres, Carlson, and FutureTouch.